If you are getting bored with old LG Rumour with a new model then for the customers Bell Canada has brought LG Eclypse which is an entry level device comes with good specs. According to carrier, Eclypse is an ideal upgrade for the customers. This handset’s processor is somewhat resembles with T-Mobile myTouch Q i.e. a 1GHz single core processor. 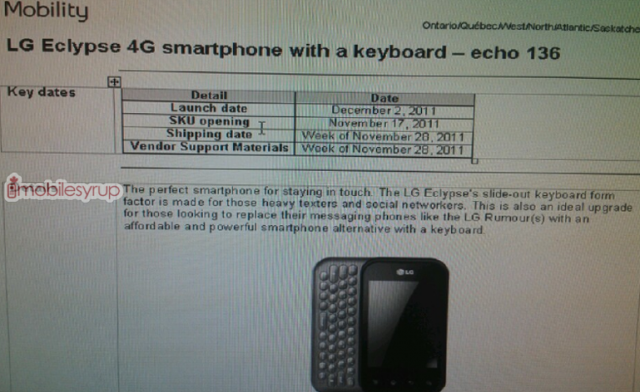 LG Eclypse is featured with a stylish 3.5 inch touchscreen display along with a QWERTY keyboard. You are able to type message with blazing speed when you have this handset. As it is an entry level device therefore it would come with a cheap price.